Is Trigger Tome® Right for You? The procedure is called the Trigger Tome® Procedure and was developed by Dr. Brian Jurbala, MD, a triple Board-certified, fellowship-trained hand and upper extremity specialist. Dr. Jurbala developed the device and procedure in direct response to his patients’ requests to have this relatively minor surgery done in the office to save time and expense. Trigger Tome® has been specifically designed to make your recovery easier, faster, and less painful. The "release" procedure, which requires cutting of the tendon sheath, can be done in only a few minutes, the same day you present the problem to your physician. There is no incision — only a puncture to the skin, which results in less pain and faster recovery. Why Trigger Tome® is Right for You. 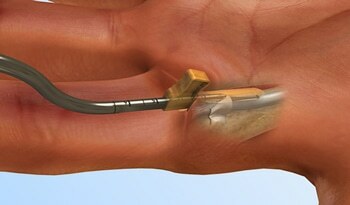 Trigger Tome has been designed to provide the patient with a less invasive alternative for trigger finger release surgery. One office visit: Trigger Tome instrumentation offers an office-based treatment alternative. No medical clearance needed, no blood work prior, all done in one office visit!